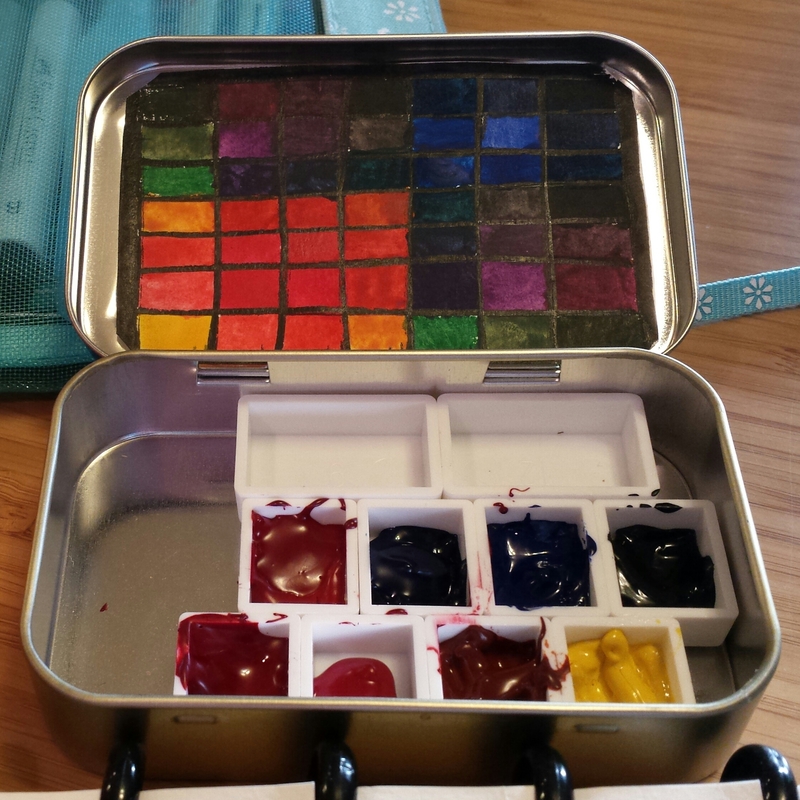 Since I started exploring watercolors, I’ve come across the “use an old Altoids tin as a travel paint box” trick several times, and it’s always intrigued me. It just looks so easy to do! It combines being creative and MacGyver-y with materials you either already have on hand or that are easily accessible, so win-win right? 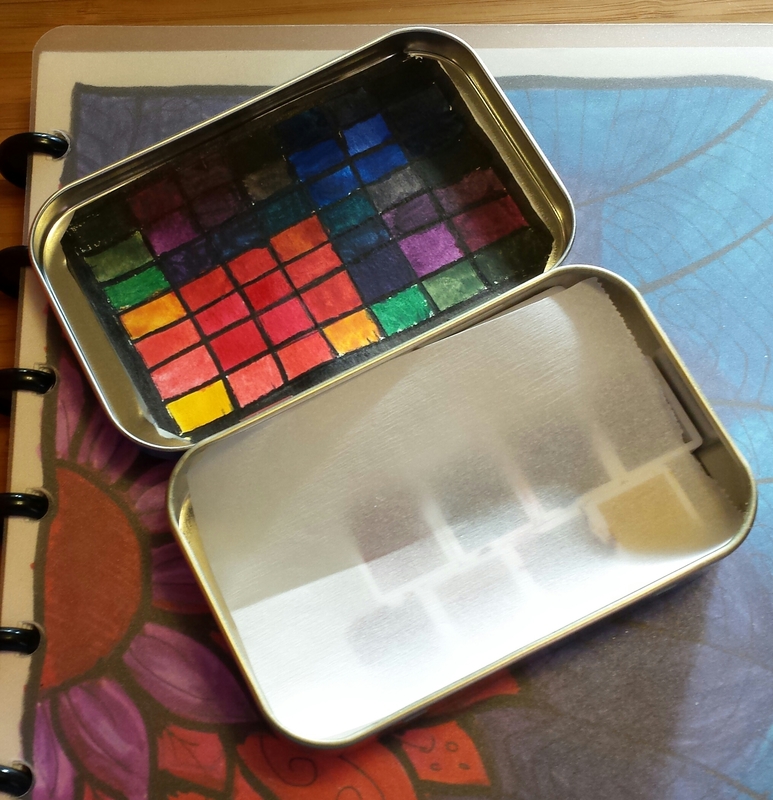 And also, regular watercolor tin boxes can get crazy expensive! Nobody said art was a cheap calling, but still – I’m just getting started and haven’t even graduated to all non-student-grade paints yet! First lesson learned – these paint boxes are waaay smaller than I thought they’d be!! I ordered 6 half pans and 2 full pans, thinking I wouldn’t be able to get all them in. But actually I have room for more – at least 2-3 half more at least. I think I’ll be ordering a few more in both sizes to experiment with finding the perfect combination. Right now I have a weird gap on the side because I had too few pans. 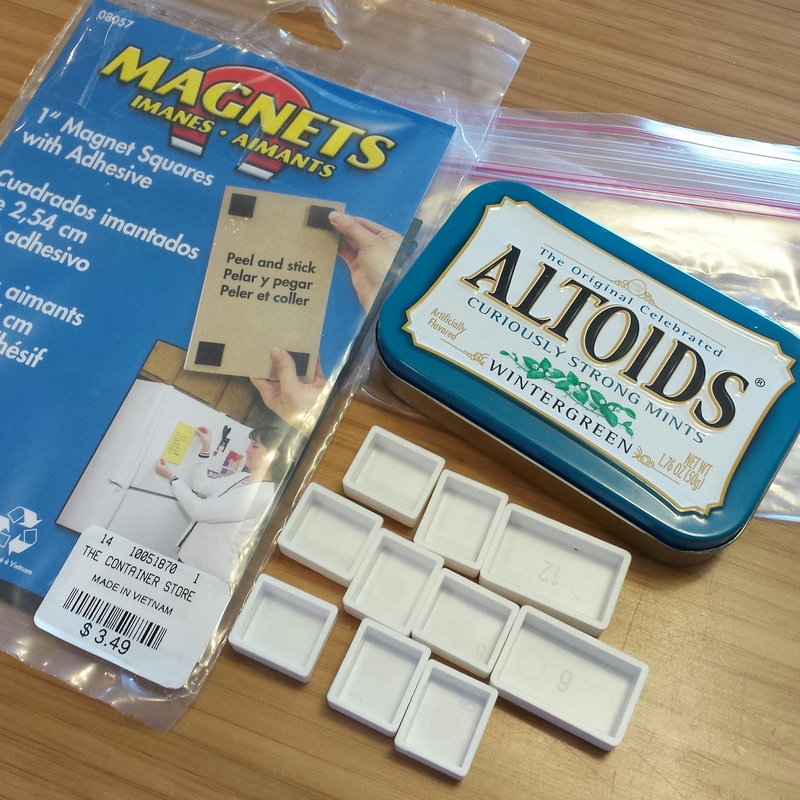 Once you’ve found a paint box layout you like, attach the adhesive magnets. The set I found had them pre-scored into 1″ squares. Cutting each square in half worked perfectly for the full paint pans, and in quarters for the half pans. They stick to the Altoids tin firmly, and even when the tin is held upside down and shaken, they didn’t fall out. The paint will dry out to avoid messiness when traveling, and can be reactivated with drops of water, or kept moist by adding a drop of glycerine. I didn’t have anything handy to add to it, so am just going to let them air-dry and add water as needed. Ideally, in the future I will find a waterproof or enamel paint to coat the inside of the lid, so I can use it as a mixing surface. 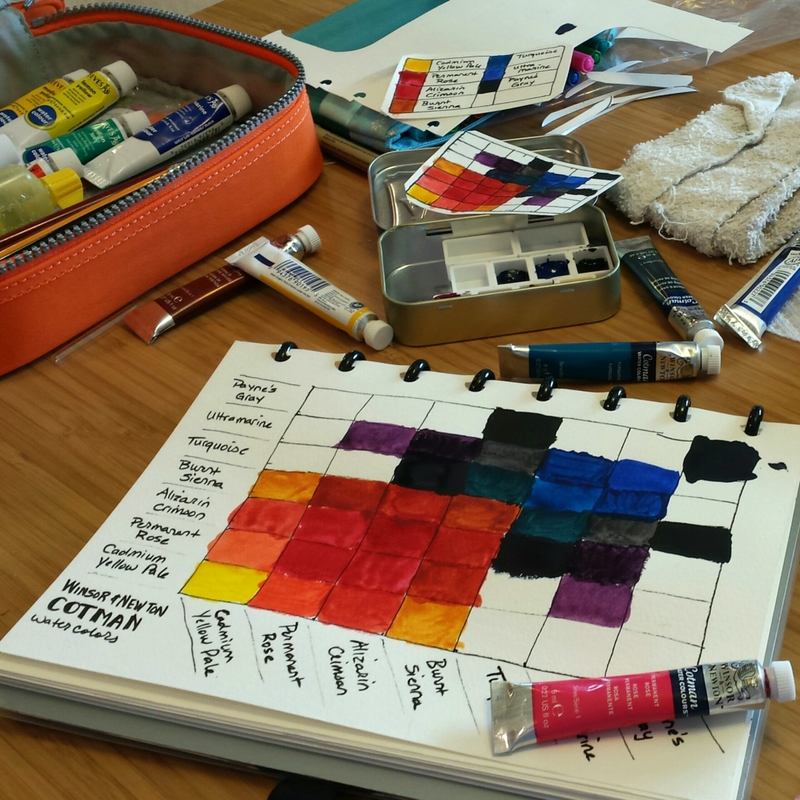 But for now, I created a mini watercolor chart to show what combinations I can get from the palette I chose. I also added a square of parchment paper to put over the paints just in case they did fall out of the pans or get messy. 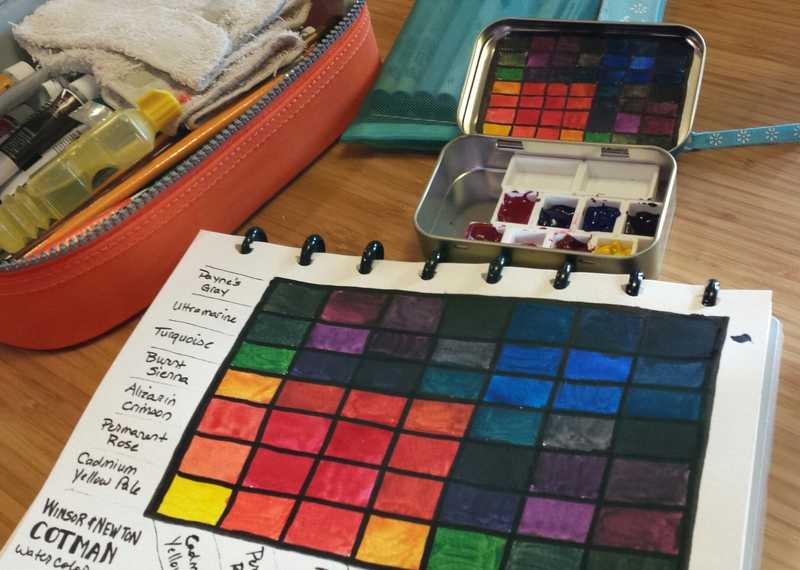 Of course, whenever getting new paints I want to make a watercolor chart! So I made both a full (sketchbook sized) version, and a little mini version to keep with the Altoids tin. I think my beginner paint choices were good ones – I can get some pretty nice secondary colors like oranges, greens and purples from the 7 colors I chose. Some action shots of the color charting process, just for fun! So, here it is in all its glory! It has some future tweaks – including coating the lid for a mixing surface, and adding some extra pans or a sponge or somehow using the blank space. But otherwise I’m really pleased with how it turned out!! 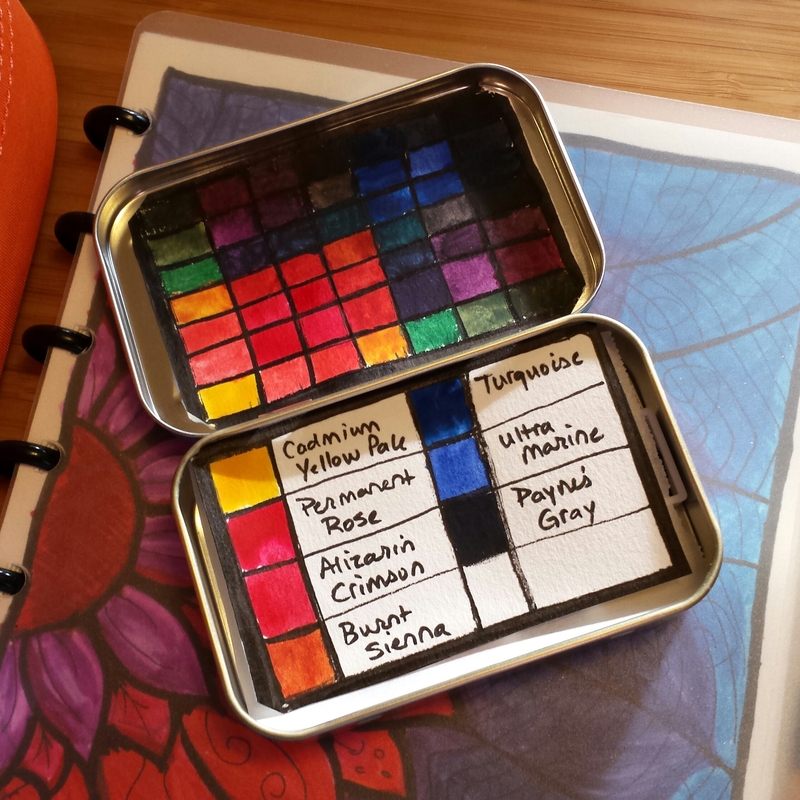 Making A DIY Altoids Watercolor Tin: The Final Result! 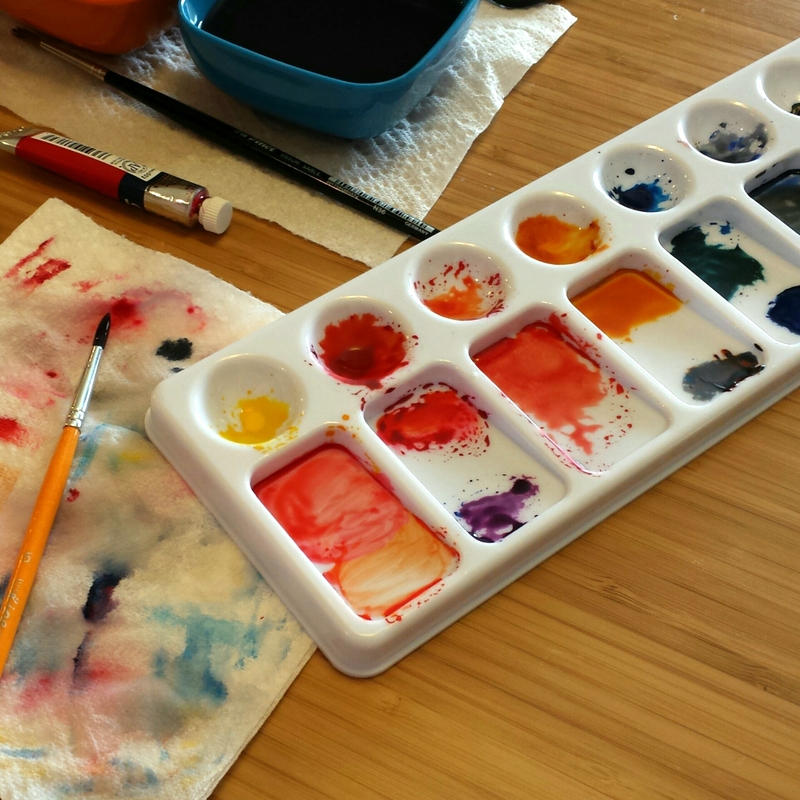 This is a great post and good instruction on making your own watercolor box. I’m gonna try it. Thanks! Reblogged this on Damita's Life. Yes, making these are great. And Cathy Johnson uses and extra lid for more mixing space. I used magnet on one of my palettes. However, when I drop it on the ground, the impact dislodges the pans, despite the magnets. So I’ve gone to double stick tape. Also, this is an idea from my friend Tina, of “Fueled by Clouds and Coffee”…. Velcro on a small stick or ruler to then hold the palette in the sketchbook. https://redharparts.wordpress.com/2012/08/22/decisions-about-my-kit/ http://tina-koyama.blogspot.com/2012/06/portable-sketch-kit-part-2-velcro-is.html I’ve also used Yupo in the lid for mixing, rather than painting it.